Rough prices listed above are based on 200ft of 6ft high chainlink fencing. Factors vary from site to site, subject to site (travel, access, corners, special materials, digging etc.) We really need to see what we're working with to give a price range. Rough prices listed above are based on 200ft of Custom Cedar fencing. Factors vary from site to site, subject to site (travel, access, corners, special materials, digging etc.) We really need to see what we're working with to give a price range. For a less expensive option, see pre-assembled panels in more services. Custom designs are priced based on customer needs. Split Rail can add an artistic flair to your yard or perimeter... It's a pretty way of saying "please don't step over this line." Design can vary. Ie. single-post vs double-post. Staggered, variable height, double rail. etc. 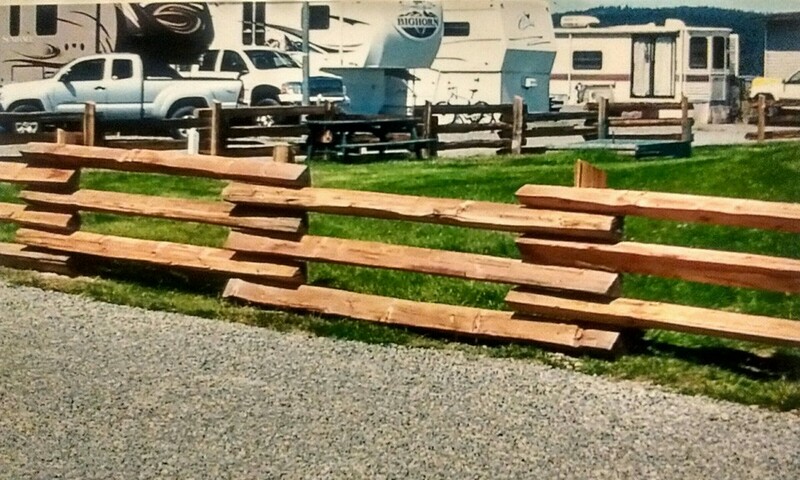 Construction: There are different ways to join split rails fences. Find a style you like online or browse the styles below in the split rail gallery on this website. There's an infinite amount of ways to design a fence. If you have a picture of what you would like your fence to look like, draw it out and we can build to suit. Or, just send us something you saw on Pinterest and we'll discuss the details needed to make it work. Panels range in price between $100-$180 per panel based depending on material style and height. Dimensions: Typically 6-ft high and 8-ft wide. NOTE: Trueline Fencing does not make pre-assembled panels. You can shop around around at Shar•Kare, Home Hardware, and Home Depot for your preferred price and style. Deer fencing is wonderful because... it keeps the deer out. 6ft high is typical for solving your deer problems. Posts: Materials can include cedar, steel, or treated pencil posts. Mesh: Typical a high tensile low cost wire with variegated whole size graduated from 2-inch bottom mesh to 6-inch upper mesh. Recommended post thickness vary from 3-4 or 4-5 inch (pencil-posts), or 2 3/8" galvanized steel pipe, or 4x4-inch cedar or treated posts. Post spacing is typically 10-foot apart. This website just went live! We’re getting our testimonials uploaded soon.